Digital addiction is an increasingly growing concern, especially for children so I used Apple's Screen Time which is baked into iOS 12 to see if it would help ween my 15-year old sister from her smartphone. 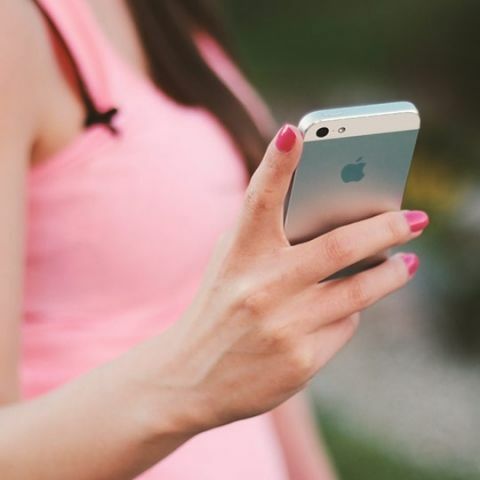 It’s no secret that all of us have been becoming increasingly reliant on our smartphones. Nowadays, a smartphone has replaced many other gadgets and collated it into one. While adults can still manage to strike a balance between their real and digital lives, young children have been having a more difficult time doing so. Growing up with a smartphone or a tablet around from the earliest years, kids have grown up with digital devices and because of that, they have slowly become one with them. I have a 15-year old sister who we found slowly walk away from her hobbies and sports and sinking into content consumption through Snapchat, Music.ally and various other social media platforms. Children are the most gullible and easy to draw in and as such, app developers often target them to increase their download numbers. Despite all of this, it was decided that my sister would be gifted an iPhone 7 for her birthday, which was in July. Let me explain. Earlier this year in June, Craig Federighi, Apple's senior vice president of Software Engineering announced all the new features that were going to be a part of iOS 12. Of all those features, there was one called Screen Time that stood out. Through Screen Time, a user could set limits on how long each app could be used, locking the app out after you’ve reached the end of your limit. You can set a “downtime”, an allotted time where all apps are locked out so as to provide a distraction-free environment. But what was more interesting was that you could set up Screen Time on any iPhone that was part of your iCloud Family, and set it up as a child account. With this, Apple had brought what looked like an incredibly granular level of “parental control” to the iPhone. After testing out the iOS 12 beta for a couple of weeks, I had decided that the sister was getting an iPhone. Why? Because with Screen Time, it would be possible to finally limit her time on the phone by setting limits on how long she could use various apps. Additionally, I would also be able to help me ensure that she isn't on her phone past her bedtime. It sounded all too good and we couldn't wait to implement this experiment at my home. Now we (as in my parents and I) have had multiple discussions with my sister about her excessive use of smartphones and tablets. After she unboxed her first iPhone (yea we have a video and it is AWESOME) and got it set up, I enrolled her iPhone on the public beta program and installed the iOS 12 beta in order to be able to setup Screen Time. The app limits were decided by me, and I decided to be “reasonably aggressive.” She thought it was cruel, but we’re not debating semantics here. Unfortunately, Screen Time doesn’t let you configure “per-app” limits initially, and instead, applies limits to app categories. Her Social Media usage was limited to 30 minutes a day, as was gaming. Even the Entertainment category (which includes Netflix, Music etc) was cut off at 30 minutes. She was NOT happy. It has been two months now since my sister has been using her iPhone with Screen Time active on it. While initially there were many hissy fits and incidents when my sister would say “it's better if you just take away my phone, than make me live with it in this locked state,” things have started to change a little. Her time spent on the iPhone has come down noticeably. From being a couch potato, all day staring at the screen, she is now spending more time reading. There are days when she doesn’t do anything on the phone except make and receive calls, which comes as a shock to all of us at home. But then again, there are sometimes days where we get into heated arguments over increasing her time limits, especially on weekends when her time limits are exhausted way too early into the day. It hasn't been easy for her or us, but it did become a necessity. Setting app limits is only good and effective only if the parent and child have a conversation. While she was not happy with the limits, we explained why they were there, reinforcing our arguments with examples from the past when her performance in school has taken a hit due to her smartphone usage habits. She was also informed that every time she was caught with someone else’s phone or the iPad, she would have her app limit reduced by 5 minutes, with no extensions allowed for a whole week. Conversely, if she didn’t ask for an extension for a particular app category for a whole week, I would add 10 extra minutes to the limit. 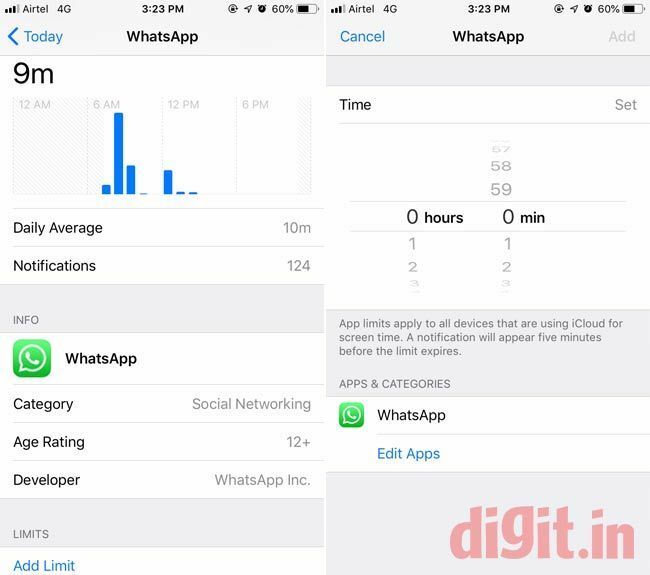 While Screen Time has helped limit a lot of unnecessary smartphone usage, it has also inadvertently blocked many apps that would be otherwise useful. For example, Music is not an app that needs to be limited, but since it falls under the “Entertainment” the app would get locked out even after 30 minutes of Netflix. In order to prevent this, the Music app had to be put under the “always allowed” category. The only way to actually set per-app limits is by clicking on the daily usage graph which shows detailed app statistics and then assigning an individual limit to the app. 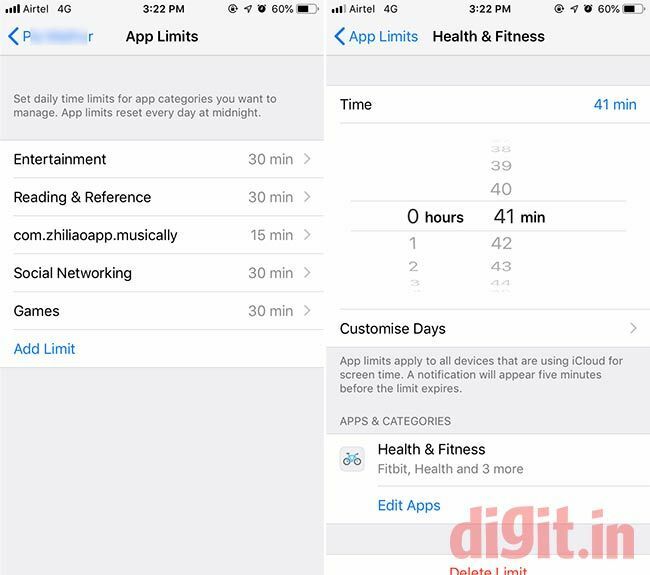 It’s not the most convenient method, and I wish Apple would allow setting app-based limits instead of category-based limits. It’s still a work in progress, but it is a solid first step. Google too has something similar called Family Link which provides similar parental controls and I will be writing about them in the coming week in detail to see how they compare. Unfortunately, Google only launched Family Link in India yesterday, so at the time we were deciding between Android and iOS for my sister, the scales were tipped in favour of iOS. Screen Time is a great step towards providing a reality check on just how much time we’re spending engaging with the apps on your phone. What turns out to be even better is that through Screen Time, parents will be able to regulate the amount of time their child is spending on smartphones, which has been a concern for many parents. However, locking a phone down has no meaning if you’re going to allow your child to get their hands on another tablet or smartphone. More importantly, if you're not going to explain to your child (in a reasonable manner) why these limits exist, the impact of this entire exercise will be fleeting. This has been an extremely challenging experiment for me as it has brought on a lot of tough conversations between my sibling and I. In the end, we only achieved half of our goals, that is, reduction in time spent on the phone. Now we embark on a journey to figure out how to re-ignite her passion for all the things she used to love doing before getting sucked into the world of digital validation. how do I check RAM usage of my Smartphone? How to check my Subscription status ? How to check my IMEI number? How can I check my subscription status? How do i know the last boot time of my smartphone ? How do I take a screen capture on my smartphone?